Glacier Southern Lakes Helicopters has been doing aerial filming for more than 25 years, and has a close working relationship with Shotover. When an innovative New Zealand company develops a cutting-edge aerial camera system a stone’s throw from an airport where a helicopter operator services A-list movie productions, it offers a fortuitous match. Add to that jaw-dropping scenery of mountains, lakes, valleys, waterfalls, forests and fiords, of epic movie proportions on their doorstep, and that’s a trifecta. Queenstown’s Glacier Southern Lakes Helicopters has been doing aerial production for the cinematography industry for more than 25 years, complementing its scenic flight operations that include spectacular glacier landings. And Shotover Camera Systems created and manufactures state-of-the art gyro-stablised cameras for filming aerial movie sequences. 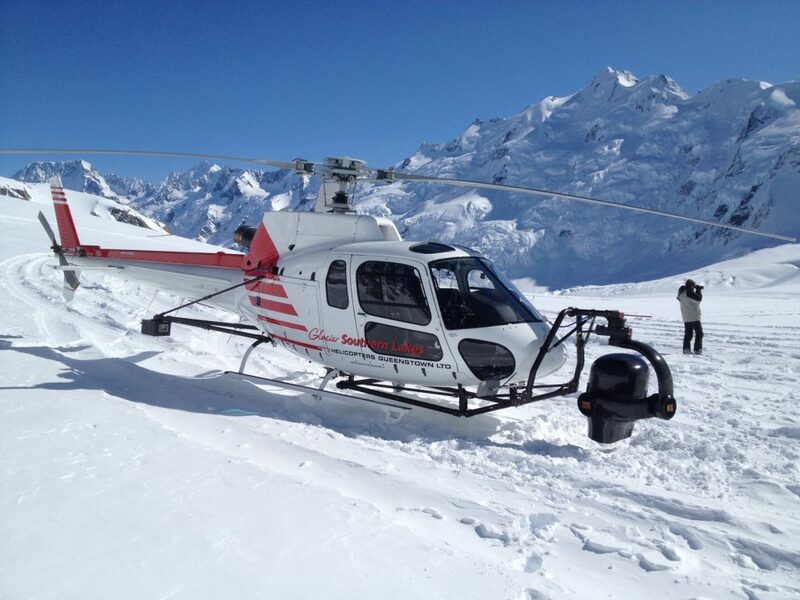 Glacier Southern Lakes tests Shotover’s cameras with an aerial team that has garnered an international reputation in the movie industry for the vast experience and skills of pilots and the ground team. Glacier Southern Lakes is bound by confidentiality agreements around movie productions so staff can’t talk about movies until after they are released. 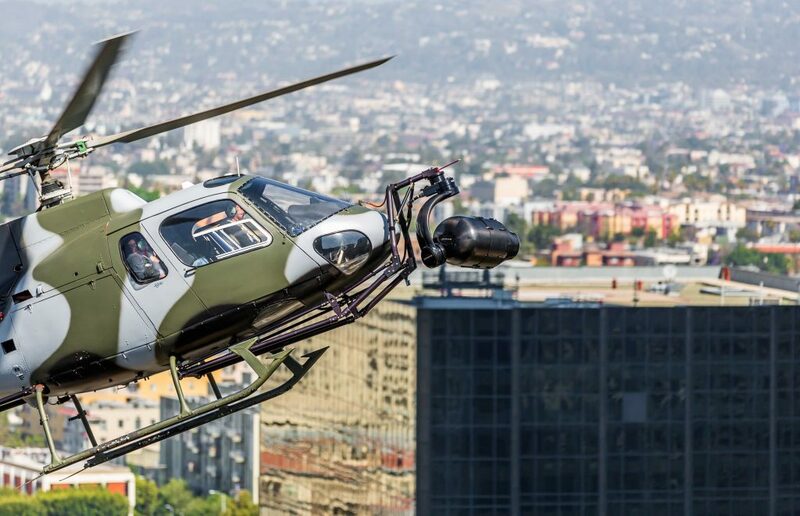 But a recent Paramount Pictures behind-the-scenes short film about the aerial sequences filmed in the Rees Valley, Nevis, Milford Sound and other areas near Queenstown for the upcoming Mission Impossible Fallout movie clearly identifies the company’s helicopters on location. A trailer, also released by Paramount, shows lead actor, Tom Cruise doing a dangerous barrel roll in a helicopter over a waterfall that looks remarkably like the 580m Sutherland Falls, near the famed Milford Track. Cruise spent hundreds of hours more than the requisite 200 hours training for his helicopter pilot licence so he could do his own stunts. When he promoted the Mission Impossible movie on the BBC’s Graham Norton show recently Cruise said the helicopter sequence “was incredibly exhilarating and very dangerous, so there’s really only one country that would allow us to do this. That country is New Zealand.”It should be noted though that Cruise might have been more effusive about the location rather than the rules around risky stunts, because New Zealand’s safety rules around flying helicopters are in sync with other countries with no special waivers for daredevils. Shotover Camera Systems was co-founded by American John Coyle, a mechanical engineer. He had moved to Queenstown with his family in 2007 after selling Cineflex, where he had created the world’s first high-definition aerial camera system, to Californian-based diversified flight services company Helinet Aviation. He then sold Shotover Camera Systems to Helinet in 2012. Squirrel helicopter fitted with a Shotover K1 camera in San Andreas. Helinet’s founder and president, Alan Purwin, was killed in 2015 in a plane crash in Colombia when he, another pilot and an aircraft maintenance engineer were returning to base in a Piper Aerostar during the filming of another movie featuring Tom Cruise, American Made. Legal action over that crash is still wending its way through American courts and last year Cruise was dragged into the frame over where the responsibility lay for the accident. Purwin’s wife, Kathryn, now runs Helinet with Shotover Camera Systems still under its wings. Coyle left Shotover after the sale and in another partnership, rents out aerial camera systems to movie companies filming in New Zealand, including those manufactured by Shotover, which is now run by Brad Hurndell. In January Hurndell, Coyle and former Shotover staff Vikas Saythaye and Shane Buckingham shared the glory of being recognised by the Academy of Motion Picture, Arts and Science for Shotover’s K1 camera system, the biggest in the company’s production line. The academy made the scientific and engineering award for the “gyro-stablised aerial gimbal platform featuring an open architectural design for the most comprehensive range of camera and lens interchanges”. It praised the innovative six-axis stabilised aerial camera mount for its enhanced ability to frame shots while looking straight down, allowing greater creative freedom and pilots to fly more effectively and safely. Hurndell dedicated the award to the late Purwin. It’s not the first major accolade the company has received either. Last year it won the 2017 Technical Lifetime Achievement Award from the Society of Camera Operators. Shotover’s camera systems are a quantum leap from the large and heavy camera balls used by the industry previously. In less than a decade its aerial camera systems have captured around 90 per cent of this highly specialised sector in the global movie market. They’ve been used on around 200 movies filmed in New Zealand and overseas to date, and are manufactured in a range of sizes, depending on the need. With such high precision they do not come cheaply. The K1 for instance, sells for NZ$664,000 (A$610,000). Each sits out the front of a helicopter, looking like a bulbous nose on a specially designed rig attached above the skids. This braces it sturdily for filming at any angle with the most advanced cameras and lenses. Clients buy the systems, not only to lease to moviemakers, but for many other activities that require filming from above, be it Formula One motor racing, broadcasting weather reports, documentary production, surveillance, industry surveys or advertisements. Hurndell says Shotover has come a long way since its system was used for the first time on the BBC’s 3D production, Walking With Dinosaurs in 2013. He and his team work in a small, but busy open-plan office. The company has a staff of 30 in total, most working in New Zealand. The only visible clue that the Queenstown office is connected to Hollywood is the framed posters of movie blockbusters lining the walls that have used Shotover’s products for aerial filming. Manufacturing of the camera systems is outsourced, mostly in New Zealand but the assembly is done in its office. Hurndell is thrilled about the academy win. He says the K1 is the number one system used for blockbuster movies. But the down to earth Kiwi is not one to rest on his laurels. The company is making inroads into the drone market with its latest camera-mounted system for UAVs. The movie industry, drone enthusiasts and others are eyeing it keenly. The Shotover team spent its formative years researching, developing and creating the next evolution of mounts and systems for aerial filming with input from Hollywood’s top aerial cinematographers. The secret lies in a carbon fibre composite structure with honeycombs inlaid into the arms. Hurndell says every piece of aluminium possible was taken out of the structure to make it as light as could be, but at the same time making it as stiff as possible to maintain stability. The advantage of it being so light is that helicopters can have a full passenger load and fuel on board when using it. It can also be pulled apart and packed up small enough to be checked as excess baggage on flights to filming destinations. An ergonomic control panel with a graphics-overlaid monitor feed in the helicopter cockpit gives the camera operator precise control over the camera, regardless of the helicopter’s movement. The high-performance gyro they use, however, is not contracted by the US Department of State. Hurndell worked in Christchurch for the Royal New Zealand Air Force as an aircraft technician before joining the Shotover team. Word of mouth led him to Queenstown-based Peter Thompson, a world-renowned aerial cinematographer with more than 11,000 hours of helicopter filming all over the world to his credit. He was the other founder of Shotover Camera Systems. These days Thompson has his own business filming and leasing out camera systems, but he keeps in close contact with the company. With aerial sequences using the Shotover system featured in so many of the films made in New Zealand and overseas, the company has become so widely known in the industry it is more often than not simply known as Shotover. The name is an irony not lost on Hurndell for it has nothing to do with shooting over anything at all. Coyle, named it after the road where he lived in Queenstown which in turn got its name from the nearby Shotover River, so named by a pioneering settler after his friend’s British estate. The river is famed for the exhilarating jet boat rides operated on it. Glacier Southern Lakes Helicopters, Shotover cameras and New Zealand’s awe-inspiring scenery are an unmatched combination. Gleaming helicopters line up in Glacier Southern Helicopters’ spacious Queenstown hangar on the edge of Queenstown Airport. It has two helicopters based at Franz Joseph on the South Island’s West Coast and seven in Queenstown, including a three-month old Airbus EC135 P2+ that caters to the luxury end of the flight-seeing market. This helicopter will also be available to the movie industry for filming and transporting actors. Ngãi Tahu Tourism, one of New Zealand’s largest tour operators owns the company. General manager Matt Wong says movie production accounts for about 30 per cent of the business and it’s growing, not only with overseas contracts, but also from the Zealand Film Commission, Film Otago Southland, New Zealand Tourism and others in the local film industry. He says overseas interest in New Zealand as a film location is also expanding. Recently his company has worked with film crews from China and South-East Asia. As the company has built up experience, expertise and industry contacts that bring repeat business over a couple of decades, it makes it difficult for new entrants to enter the sector when they don’t have a track record and Glacier Southern Lakes pulls all stops to ensure it keeps that pole position. “It’s a whole package,” says Wong, citing many factors that need to be taken into account when large film crews with big budgets come knocking. Not only must pilot experience and expertise be to the fore but there is administration, insurance, securing location filming rights from New Zealand’s Department of Conservation or local authorities and ensuring the helicopters are the right mix and age. “We can stand the test of any audit as far as safety, machinery and our pilots are concerned,” Wong says. That means planning up to six months ahead of filming. The company has a big enough fleet to handle small to large productions. Never far from the action at Glacier Southern Lakes Helicopters is film manager and pilot, Alfie Speight, who has a reputation as a bit of a legend in the film industry. He’s the one in the latest Mission Impossible trailer inside the hangar watching Tom Cruise holding a tiny helicopter model in his hand, demonstrating how he will manoeuvre it on set. Wong says discretion is the key in the movie business. Speight is a man of few words who keeps his work with movie crews and celebrities very close to his chest. But his track record in the film world is impressive. He has more than 15,000 hours experience flying helicopters around the world and in New Zealand for movies such as Peter Jackson’s The Lord of the Rings and the Hobbit trilogies, for Wolverine, King Kong and many more. His varied career also includes four stints in Antarctica supporting Italian and American scientific research. “Whether it is people, trains, planes, automobiles, marine vessels or wildlife, Alfie’s reputation is unsurpassed as the best in the business when it comes to aerial film work and production filming,” says Wong. Speight’s work complements the 7,000 hours of flight time Glacier Southern Lakes general manager, aviation Pat West has as an aerial co-ordinator, a vital role in the movie business. He’s worked with every available camera system and cinematographers and film pilots in all fields. He was the main aerial coordinator in New Zealand on the movies Vertical Limit and 10,000 BC. As for the camera system testing for Shotover: “They’re true professionals,” says Wong. 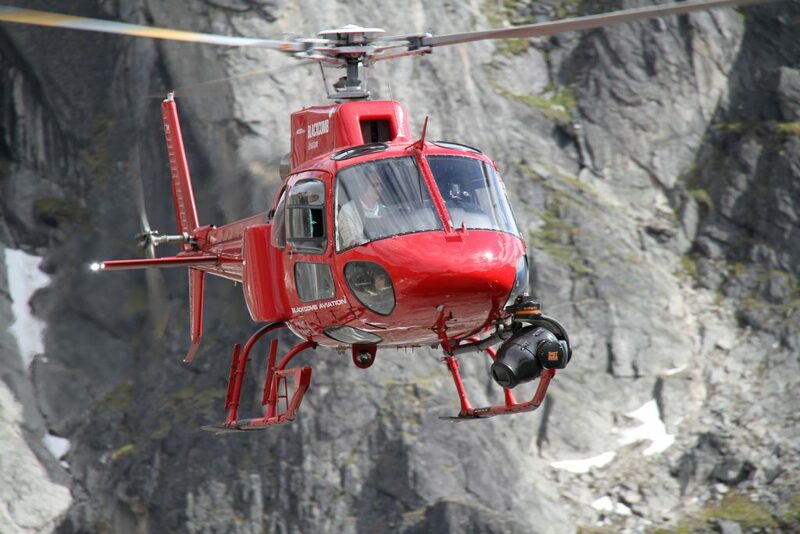 Location and filming credits at the end of movies might be tiny but the work of Glacier Southern Lakes Helicopters, Shotover Camera Systems and acknowledgement of New Zealand as a location feature frequently. Dunkirk, A Wrinkle in Time, Pete’s Dragon, Alien Covenant, X Men, Furious 7 – there are just too many to mention. 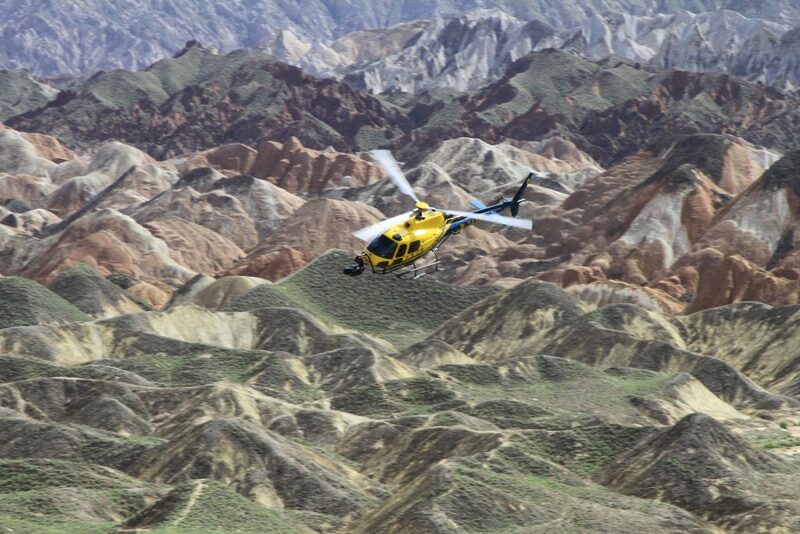 A Squirrel helicopter equipped with a Shotover K1 films in China. As well as helicopter-mounted camera systems, Shotover has also developed units that can be carried by jet aircraft, drones and ground vehicles and platforms.